READ ABOUT THE SI FERRY AND WRITE A COMMENT ABOUT A TIME YOUR RODE THE FERRY OR SOME FACTS YOU LEARNED. Over 35,000 trips are made annual. Soon after Staten Island joined New York City in 1898, ferry service between St. George and Whitehall was transferred to the city Department of Docks and Ferries on October 25th 1905 and five new ferries — one named for each of the five boroughs — were commissioned. In 1926 the city’s original white color scheme was eliminated in favor of a reddish-maroon. This was changed to municipal orange later so that they could be seen in heavy fog and snow. The Dongan Hills was hit by a Norwegian tanker in 1960. The 5 cents fare was established 1897. On October 10, 1972 the fare was raised to 10 cents. In 1975 the fare was increased to 25 cents. On August 1, 1990 the fare went up to 50 cents. Finally on July 4, 1997 the fare for foot passengers on the ferry was eliminated. June 14th, 1901 the ferryboat Northfield was leaving Whitehall when it was struck by a Jersey Central Ferry the Mauch Chaunk and sank immediately. Fortunately there were two full deck crews aboard the Northfield and their swift actions saved many. Out of 995 passengers aboard the Northfield only 5 ended up missing. This accident was one of the major reasons that private operations of the ferries were ended and the City of New York took control. The Pvt. Joseph Merrill and Cornelius G. Kolff ferries were converted to prison dormitories for Riker’s Island. On April 12th, 1995 The Ferry boat Barberi plowed into 4 slip in St. George due to a mechanical malfunction leaving 4 slip out of service and injuring a handful of passengers. The doors on the saloon deck were crushed by the aprons. The accident would have been much worse if not for the heroic actions of the bridge man who remained on station and lowered the bridge (While 7,066,000 lbs of Municipal Orange steel was heading straight for him) to the right height to help stop the boat. 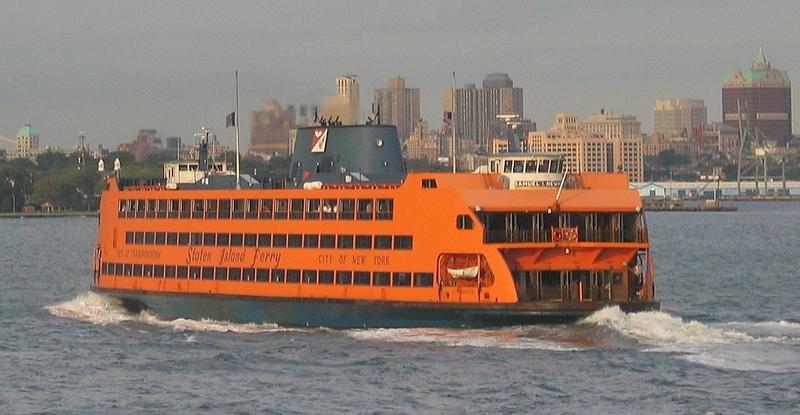 After the 9/11 attack on the World Trade Center the Staten Island Ferry transported tens of thousands of people out of lower Manhattan to safety on Staten Island. The captains docked the ferries under zero visibility as the smoke and debris from the collapses filled the sky. The following days passengers were not allowed on the ferries. The fleet was being used to transport emergency personnel and equipment to and from lower Manhattan. In addition to the emergency personnel and equipment the ferries were also being used to transport military personnel and equipment to Governors Island and lower Manhattan. Included in this were U.S. Army tanks. In the 1700s, ferry service was provided by private individuals with small two masted sailboats called periaugers. July 7th, 1986 a mentally disturbed person (Juan Gonzalez) with a machete attacked passengers on a ferry. Two people were killed and nine others were wounded. October 15, 2003 at about 15:30 the ferry boat Andrew J. Barberi slammed into a maintenance pier at the Staten Island Maintenance Facility on Staten Island. The impact of the crash snapped the pilings at the seaward corner of the pier like toothpicks. After ripping apart the pilings the concrete slab of the pier tore through the main deck Staten Island end Jersey side of the ferry. As the concrete slab raced down the boat it wiped out everything that was in its path. Seats were ripped up and pushed to the back of the boat. The aluminum superstructure was ripped open like a tin can. All that could be done was to run and hope you could be quicker than the concrete slab. 10 people died that day and an 11th person died two months later from injuries from the accident. One lucky passenger jumped out the window of the ferry as the concrete slab headed towards him into the water and was rescued by maintenance personnel at the ferry. September 19th, 1997 a car drove off the Staten Island Ferry and plunged into the water as the boat was approaching the slip. Upon seeing a car drive off the boat the captain of the ferry slammed his controls into reverse to stop the boat. The force of the impact of the car in the water causer the rear windshield to blow out of the car. This rush of water also carried the driver of the car out the back windshield. One deck hand was knocked into the water by the scissor gates at the front of the boat as the car pushed them aside. A dock builder who was working in the area jumped into assist the deck hand and the driver. The driver of the car was an employee of the ferries when the accident happened. ~ by stufffromthelab on July 8, 2008. I learned about the staten island ferry. When i went on the staten island ferry it is very cold and big. It’s alot of people on the ferry. The immergriants came over to ellis island to come to our country. I learned that 20 million travel every year on the ferry. What i lrnade about the staton island fere that it can hold more than 100 people and there only 3 boatse and you can see the staton island fery and it is betr then iney othr boas there is because it is fee. i went to the staten island ferry. i love the staten island ferry. the staten island ferry was fun. i like Ellis island. i got on a boat and rode to Eilis island. What i learned about the staton island fere that it can hold more than 1000 people and there only 9 boatse and you can see the statue of liberty island fery and it is better then any other othr boas there is because it is free. 20 million people travel on it every year. the ferry haves a good view The Statue of Liberty and Ellis Island. It provides 20 million people a year. Operator New York City Department of Transportation. the staten island ferry it’s is orange.About 20 million a year ride it. I have ridden on the ferry and it is a fun ride. I like the Staten Island Ferry. It has a beautiful view of the Statue Of Liberty. My family and I love to ride the ferry into the city to go shopping. It it a smooth and relaxing ride! the staten island ferry is very large. 60,000 people ride it a day.20,000,000 people ride it a year.from staten island to manhatten is 5 miles.the statue of liberty is between staten island and manhatten. the staten island yankees are on the north shore of staten island. the 3rd floor went there last week.the 2nd floor is going this week. it is going to be fun. People like to go on the ferry boat. More than 20 million people ride the ferry every year. My father rides the Staten Island ferry to work almost every day. It give us a clear view of Governors Island, Ellis Island and The Statue Of Liberty. I love that Bright orange boat!